Gorgeous nature, spellbinding landscapes, fascinating culture and amiable people - we are talking about one of the oldest settlements in Manipur, Maram Khullen. Located at a distance of some 27 km from the town of Senapati, Maram Khullen is definitely a place worth exploring for tourists in Manipur. As you walk step into the town of Maram Khullen, the soothing surrounding of the place takes you back to the rich history and beautiful culture of this beautiful place. If get a chance, interact with the locals to know more about their well-preserved culture and various folklores associated with this place. The hill town of Maram Khullen has more than 1000 houses that boast a traditional style of architecture which is known as Akajalika. A unique thing associated with these houses is that it is said that one must build a house in Akajalika style in just three days, and hence, in order make it possible, people of the village come together to help to build the house. 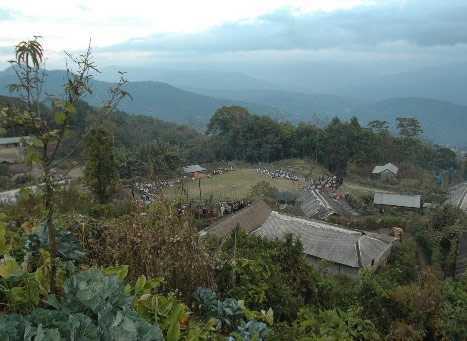 On a whole, Maram Khullen is one such tourist attraction in Senapati district that allows tourists to explore the unexplored and lesser-known part of Manipur. Keeping the weather conditions of the place into mind, the months of winter,.i.e., from October to March are considered the best time to visit Maram Khullen. During the winter time, the temperature remains in favour of tourism, and hence, it allows one to explore the region to its fullest. However, a number of travellers also visit the place in the summer season as it is also considered the ideal time to visit Maram Khullen.